A parametric, modular, acoustic wall lining system. 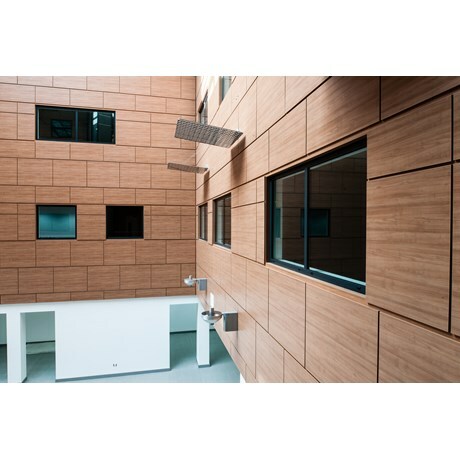 Comprising a removable Dimi acoustic timber based panelling and self-healing steel frame. A simple, quick and cost-effective solution. Range of performances, textures and finishes available. Galvanized steel supports, with self healing properties. High traffic public areas within the commercial, educational, hospitality, infrastructure, residential and retail industry sectors. B-s1, d0: Lacquer, real wood, softwood. Internal, External and End Cap Arrangements. Double-sided tape and flash gap strips. Other SanFoot species available, consult manufacturer. The product information below is from the NBS Plus library of product clauses offered in NBS specification products. It has been created by NBS for Inspired Surfaces. Each product clause is authored in NBS format and is intended for inclusion in project specifications. Please note that NBS product guidance is not a replacement for the manufacturer's literature and it is recommended that Inspired Surfaces be consulted before specifying. Manufactured in accordance with DIN EN 13501-1.